David Cameron: "It's very important that the eurozone is stong, stable and growing"
Prime Minister David Cameron has defended the government's decision to keep Britain out of the euro, during a meeting with the French President. He met Nicolas Sarkozy while on his first foreign trip since taking office. Meanwhile EU leaders stepped up efforts to restore the credibility of the euro amid ongoing problems in the eurozone. Mr Cameron said Britain needed the eurozone to be a success but added: "We were right not to join the euro and... right to stay out of the euro." The Conservative and Liberal Democrat coalition government has said the UK will not join, or prepare to join, the euro during this parliament. Mr Cameron told a news conference in Paris that pledge was "important". "I think we were right not to join the euro and I think were right to stay out of the euro. "But let me be absolutely clear, it's in Britain's interests that the eurozone is a success, that the euro is a successful currency, that the eurozone economies recover," he added. The UK would "work well" with other nations and play its own part by sticking to a stability pact, agreed by the previous Labour administration, and acting quickly to reduce it own deficit, he said. But he added that as a non-member of the eurozone the UK should not bear the costs of any bail-out. When he reiterated his "fundamental" concerns about the euro and determination to keep Britain out of it, Mr Sarkozy insisted the single currency had proved "a success". Earlier this month, the EU and International Monetary Fund agreed a package worth 750bn euros to try to prevent the Greek crisis from spreading to other weak eurozone economies. The 16 single currency member states have signed up to the bail-out. On Wednesday German Chancellor Angela Merkel warned the euro was "in danger" without strong action, but France's economy minister said the currency was not at risk. Germany - Europe's largest economy - has been helping to stabilise the euro, which has fallen to a four-year low against the dollar this week, before strengthening. Thursday afternoon saw it falling again, down 0.7% to $1.234. With the rescue package promise failing to steady markets, finance ministers have been summoned to Brussels on Friday to begin work on closer "economic governance in Europe". 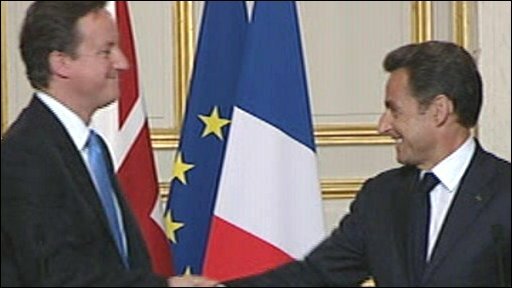 Following his talks with Mr Sarkozy, Mr Cameron said the leaders shared the view that forthcoming G8 and G20 meetings should address financial reforms including levies on banks, he said. Mr Cameron also hailed a commitment to work together to ensure success in a "crucial" year for the military campaign in Afghanistan. They would also make joint efforts to "tip the scales" in pressurising Iran to give up its nuclear ambitions through harder United Nations sanctions, he said. "From all the things we have discussed tonight, I think we can have a partnership that has a real purpose, that is very focused, that is very practical, that actually leads to results in the things that we both care about," said Mr Cameron.